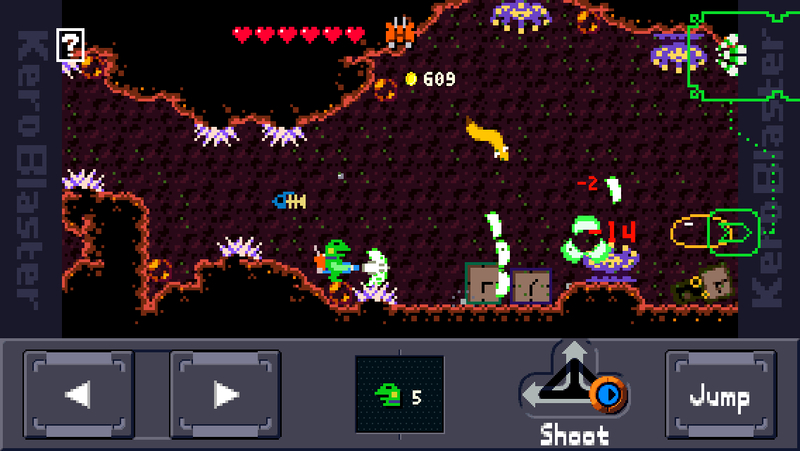 It’s hard not to think about Cave Story while playing Kero Blaster ($5.99). For those unfamiliar with Cave Story, it was one of the first big games of the modern indie era. Released all the way back in 2004 on PC, it was an extremely impressive take on the Metroid-style non-linear action game genre. Packed with challenge, secrets, and great action gameplay, it held up strongly to the best the genre had to offer. On top of that, it was faux-retro well before that became trendy, featuring adorable and expressive pixel-art characters and a wonderful chiptune soundtrack. Released on the PC for free and ported to almost everything under the sun except mobiles, it drew attention to the indie scene in a way no other game had before and few have since. It wasn’t just a great game, it was an important game, and it was all the product of one single person: Daisuke “Pixel" Amaya. Cave Story was the result of five years of work for him, and it shows in every respect. Cave Story made a lot of fans, and while some could find satisfaction going through Pixel’s back catalog and playing smaller-scale games like Ikachan and Azarashi ($0.99), or playing through Pixel’s shoot-em-up Guxt, most waited anxiously for another game in the same vein. Naturally, people were quite excited when Pixel announced Gero Blaster in March of 2013, since it looked to have the same style of 2D action-platforming. Success can be a double-edged sword, however, and following up an act like Cave Story isn’t an enviable task. It’s little wonder that it ran into some problems that prevented it from coming out on its planned May 2013 release date. 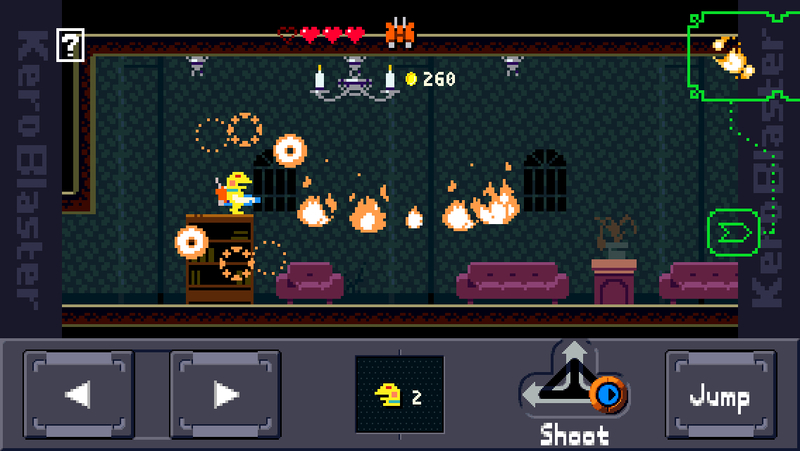 Apparently, Pixel wasn’t satisfied with the game, so he brought in an extra hand, tore the game to the ground, and rebuilt it as Kero Blaster. Like I said in the opening, when you start playing Kero Blaster, you’ll be instantly reminded of Cave Story. It has the same sort of off-beat sense of humor, chip music of similar quality and composition, pixel art graphics, and a vaguely similar style of play based heavily on platforming and shooting. However, this thought imposing itself into your mind does Kero Blaster no favors at all. Rather than non-linear exploration based gameplay, this game opts for stage-based run and gun action. You can find new weapons and items, upgrade them using coins, and even find a few secrets here and there, but this game has far more in common with Contra or Mega Man than Metroid. As hard as it is, you have to leave your Cave Story baggage at the door, because Kero Blaster is its own thing, and you’re not going to be able to appreciate it fully if you’re focusing on what it’s not. In Kero Blaster, you play as a frog who works for the Cat & Frog Agency as a master of the custodial sciences. Your boss, a rather abrasive cat, sends you out on various clean-up jobs in different locations. Every time you report back to the office, though, things seem a little bit more strange, and it’s not long before you’re tackling an entirely different kind of clean-up. In practice, this works out to seven fairly lengthy side-scrolling stages of run, jump, and shoot action, each capping off with a tense boss fight. You can’t choose your stage order, and you can’t revisit previously cleared stages at your leisure, so this is more or less a straight line to the goal. If you’re decent at this type of game, you’ll likely be watching the credits within a few hours of starting. Of course, the same could be said for almost all of the best 2D run and gun games, so that really can’t be held against Kero Blaster too heavily. In just about every level, you’ll earn a new item either mid-stage or when you beat the boss. The frog starts off with nothing more than a peashooter with limited range and power, but you’ll soon have a variety of weapons at your disposal, each with multiple levels of upgrades available. The interesting thing about the weapons is that, unlike the average Mega Man arsenal as an example, they are all useful in certain situations. One weapon can nullify enemy projectiles, another can bounce across the surface of water, and so on. So while you’ll probably lean on the spread shot once you acquire it, you’ll constantly find reason to change to your other weapons. There are a couple of other items in addition to the different weapons, with the most notable being the jetpack. In spite of what you might imagine, the jetpack really just gives you a double-jump, albeit one that feels slightly different from what you might be used to. The frog has a good bit of momentum to his jumps, so don’t count on being able to drastically change your direction in mid-air. The jetpack gives you the crucial ability to do this, though like the initial jump, once you’ve committed to a direction, that’s where you’re going. Along with his jumping skills, the frog can shoot both in front and behind him, as well as straight up. Moving and jumping controls are pretty standard virtual buttons, but the developer has done something interesting for the shooting controls, and it works surprisingly well. Instead of using a virtual button for shooting and locking your aim to whatever direction you’re moving in, your shooting is handled by what appears to be a stickshift. Swipe either left, right, or up on the triangle to start firing in that direction and the frog will continue to do so until you swipe in another direction. If for some reason you want to stop shooting, you can simply swipe down. This control layout takes the guesswork out of your aim and allows you more freedom to move while keeping a constant rain of fire on your targets, and it works so well that I hope more games pick up on it. In general, the controls are solid, though there are a few areas with precision jumps that might cause you some issues. Changing weapons is easily accomplished by either tapping on your weapon icon or hitting the little arrow just above your jump button. Doing either will pause the action and open up your arsenal, enabling you to quickly select any weapon you want. The weapons are all fun to play with, and the upgrades you get for them actually change the weapon significantly, so it always feels good to get a new power-up. Upgrades are bought using coins that are dropped by enemies. 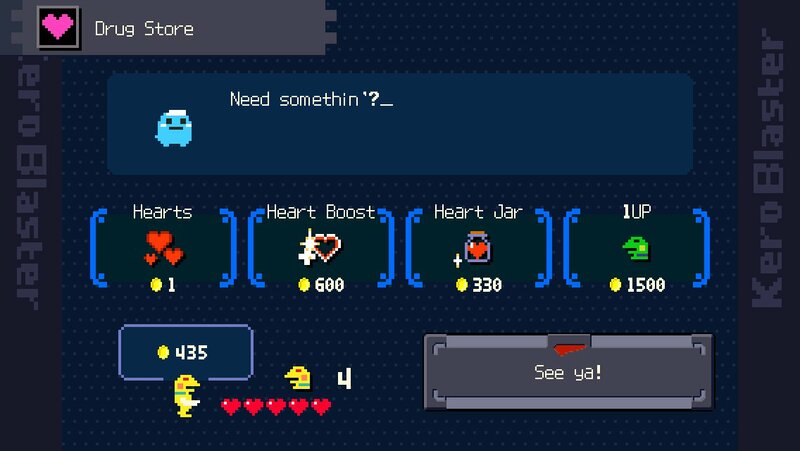 Each level has at least one place where you can shop, with both weapon upgrades and various health-related items on offer, such as life bar extensions, extra lives, or emergency heart tanks. Unless you stop to grind coins, you probably won’t earn enough to buy all of the upgrades in your first playthrough, but you should be able to max out a couple of weapons while keeping your life bar at a respectable size. Once you clear the game the first time, you have the chance to start over, this time with all your gear in tow and just a single life point, giving certain crazy people the chance to try to make it through the game without taking a hit. If you just want to relax and enjoy being super-powerful on your second playthrough, you can upgrade your life points back up again at the shops. If you poke around a bit in the levels during your second playthrough, you might even find a few new secrets. It’s a nice way to extend a game that ends a bit sooner than some might prefer, as well as giving extra challenge to those who want it. Outside of a couple of bosses, Kero Blaster isn’t that tough of a game, but the way the game is set up, those seeking a serious challenge can avoid upgrades or simply focus on finishing the game as fast as possible, since the game does keep track of your time. Extra lives are hidden all throughout the game, and even if you do get a game over, you’re simply sent back to the start of the stage you were on, with all sub-bosses you’ve defeated and upgrades you’ve bought kept intact. One thing that will be very familiar to Pixel’s fans is the presentation. The style isn’t quite as detailed as that of Cave Story‘s, but the game still looks great. The simple style of the sprites might scream NES, but the animations are full of little details that bring the characters alive. The stages themselves are gorgeous. Sometimes, they’re mundane places recreated with meticulous detail, like a train station, while at other times, they’re insanely abstract with a creeping horror about them. The natural, the artificial, the real, and the surreal are all well-represented in Kero Blaster, and the mix creates something that has an incredibly unique feel to its visuals. 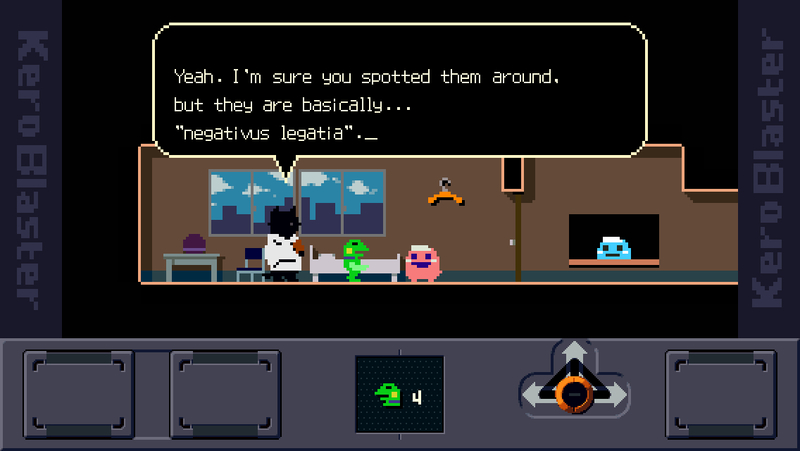 Every time you clear a level, you get a little cut scene that ostensibly furthers the story, though it’s often just there to throw a few gags out. Here, too, the bizarre and the normal are shifted between regularly, something that is often played for laughs. The chiptune music is, as one would expect from Pixel, absolutely fantastic, echoing some of Capcom’s great 8-bit tunes, with an emphasis on strong, catchy rhythms. Pixel’s got a real knack for putting together music, and he doesn’t let you down here. There is some bad news on the presentation front, however. Kero Blaster isn’t a Universal app and there is no iPad-specific version of the game available, so you’re going to have to deal with stretched visuals if you’re playing on a larger device. There is no support for Game Center, no support for controllers, and if you’re playing on an iPhone 5 or 5S, the extra screen real estate is occupied by vertical banners on both sides of the play area. You should not let any of these things scare you away from playing the game, however. The same goes for the price, which might seem a little high given the infinity-plus-one run and gun games that can be found on the App Store for free or one dollar. This game is completely IAP-free, packed full of excellent content, and is actually selling for a lower price on the App Store than the identical PC version. It would be worth it for twice the price. So, no, Kero Blaster is not Cave Story 2, and the sooner you put the notion out of your mind, the sooner you can get to enjoying an extremely well-crafted action game. Aside from my gripes about some missing bells and whistles we’ve come to expect in modern apps, the worst thing I can say about the game is that it ends. Even then, the game almost immediately encourages you to pick up and start playing again, and makes it worth your while to do so. I’ve no doubt that, like Cave Story, I’ll be replaying this a lot in a future, and just like in the case of its predecessor, I’m confident my appreciation for it will only grow in the process.